Gearing Up for Change … After a period of turmoil, the flames die down at Fireman’s Fund as the venerable carrier refocuses on its core underwriting strengths and the “high-touch” abilities of its distribution channel. After churning through five chief executives in six years, with one even taking on the role twice, Fireman’s Fund Insurance Co. employees could be forgiven if they’d been skeptical when Lori Dickerson Fouché stepped up to the podium at an employee town hall meeting last July, two weeks after she assumed the top position at the Novato, Calif., company. But before she even spoke, the 750 employees who were in her presence rewarded her with a standing ovation. It was a striking about-face for employees whose low morale was plainly in evidence through employee blogs just a few years earlier. As many as 2,850 employees — just about the entire company — came to hear Fouché speak, either in person or by video or conference call. She speculates that their response had to do with a number of practices she had ordered scrapped as soon as she became president and CEO, including an incentive program that rewarded employees for suggesting the most innovative ideas in a month, whether any of those ideas actually improved the company’s bottom line. That basically amounted to busy work, she said. “All of the employees work incredibly hard to make Fireman’s Fund a really great company, but I think we got confused somewhere along the way that activity equals results — we can’t mistake activity for performance,”Fouché said. At last, many employees thought, here was an executive willing to say no, one who was willing to walk away, one who was committed only to business the company could do well. Later, employees would also learn that Fouché, with the blessing of Fireman’s Fund’s parent, Germany-based Allianz SE, would also scrap the previous management’s strategy under former CEO Michael LaRocco, of urging agents and brokers to recommend Fireman’s Fund’s home and auto insurance products to the mass market. Instead, Fouché announced that the carrier was going to dial back and refocus on its core strengths. Fireman’s Fund had always excelled at underwriting personal insurance for high-net worth and affluent individuals, including coverage for custom homes; farms and ranches; commercial insurance for small to medium-sized businesses; “green” insurance for environmentally-friendly buildings; and policies for entertainment companies such as Hollywood movie studios, including a policy for one of the riskiest movies recently to be made, “Salt,” in which A-list superstar Angelina Jolie insisted on performing her own stunts. The renewed focus is about serving Fireman’s Fund’s core customers: the agents and the brokers who distribute Fireman’s products, Fouché said. Fireman’s Fund distributes its products through more than 2,900 agencies and brokers of all types and sizes across the U.S., she said. Fewer than a quarter of them are located on the West Coast. The company’s core mission is to “provide value to agents and brokers no matter what its size, location or specialty,” she said. Fireman’s also works with the industry’s big three, Marsh, Aon and Willis. Jay Ralph, member of the board of management of Allianz SE in Munich, said that a change in strategy for Fireman’s Fund was necessary. “Occasionally companies, like people, will attempt to do more and in some cases they are able to do so with success and in other cases, they realize that doing that short-changes their areas of strength,” Ralph said. Fireman’s Fund has particular expertise in underwriting unique or unusual custom homes, which also entails risk management services and a very high-touch claims service,none of which is necessary for policies on “cookie-cutter”homes in tract developments, Ralph said. Fouché is particularly qualified to woo agents and brokers because of her marketing background, Ralph said, and she’s proved agents and brokers that she knows a thing or two about high touch. Last Thanksgiving she sent “Thank You” cards to the top producers, including handwritten messages. “It’s not every day that you have the CEO of the company you are partnering with write you a personal note and wish you Happy Thanksgiving,” Ralph said. Fireman’s Fund’s concentration on its niche businesses is a “positive” for the company, said Brian O’Larte, a senior financial analyst at A.M. Best Co., because any carrier that spreads itself too thin dilutes its quality, particularly when chasing personal lines business. But even with its renewed focus on core strengths, Fireman’s Fund still plays in a “very competitive marketplace,”he said. Competitors include Chubb and AIG in the personal, high net worth segment, and then traditional players The Hartford, Travelers and AIG in the broader commercial lines segments. O’Larte said he expects commercial lines coverage to remain very competitive even as the market gradually hardens and translates into rate increases. In 2011, Fireman’s Fund posted revenues of $4.7 billion, up from $4.5 billion in 2010. That was down from $5.4 billion in 2009. Fouché didn’t set out to become an insurance executive. Her introduction to the industry came through her initial interest in international affairs as a student at Princeton University in the late 1980s. She had entertained notions of entering international business, after growing up in a family that hosted foreign-exchange students and then being one herself in Japan, she said. Alternatively she could have entered the law profession, following in the footsteps of one of her ancestors. Her great-great grandfather was the first African-American lawyer in Illinois, she said. Fouché thought she could explore both careers through a college internship in the international department at Chubb & Son, a unit of Chubb Group of Insurance Cos. The four-year internship was arranged by Inroads, a nonprofit offering training and support for minority students interested in business careers. After graduating from Princeton in 1991 with a bachelor’s degree in history, she accepted Chubb’s offer to become an executive protection underwriter. Even though it was not in Chubb’s international department, Fouché was grateful for the position because it was “a horrible job market” at the time. But she soon learned to love it. She learned to appreciate the basic idea behind insurance when a top Chubb executive publicly scolded her manager for not being able to explain what was driving his branch numbers. Throughout the next decade Fouché moved through the ranks at Chubb, taking time to earn a Master of Business Administration at Harvard University in 2000. 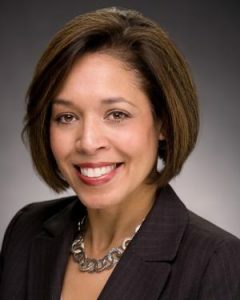 She then spent two years as a management consultant at the Parthenon Group in Boston, before returning to serve four more years at Chubb, lastly as senior vice president, private company group manager at Chubb Specialty Insurance in Warren, N.J. In 2006, Fouché was lured to Fireman’s Fund, first as senior vice president and marketing executivefor the carrier’s Specialty Insurance division in New York City. Art Moossmann, then-president of that division, hired Fouché. Moossmann, chief underwriting officer for Allianz Global Corporate & Specialty AG, said he was struck by how personable Fouché was, while at the same time being a bright problem-solver and very balanced in making decisions. Moossmann also appreciated her competitiveness, remembering a story she once told about male Chubb colleagues at an off-site strategy meeting ribbing her for being an All-American fast-pitch softball pitcher at Princeton. How fast could a softball pitcher really throw a ball, compared to a baseball pitcher, they asked. “So they went out to the parking lot and only one person could hit a foul ball on her — she struck the rest out,” he said. In 2007, Fouché became the Specialty Insurance division’s chief operating officer, before moving to the company’s Novato headquarters in 2009 to serve as president of commercial insurance. Now as CEO, Fouché is focused on creating a “performance culture” through a series of 90-day action plans, entailing such initiatives as increased agency engagement, she said. But the broader task is to develop a clearer strategy of just how the company can become more profitable. However, industry premiums overall grew by only 2 percent or 3 percent in 2011, while at the same time, the combined ratio for the industry was significantly more than 100 percent, which meant the industry as a whole was losing money. “So you want to make sure you’re not growing unprofitably by picking up that business that other people thought was unprofitable business,”Fouché said. “And then we’ll have conversations in a few more months with Allianz, our parent, as to what we really think we can do in 2013, 2014 and 2015,” she said. Kathleen Zortman, hired in October as Fireman’s Fund chief field executive, said she was attracted to Fireman’s precisely because of Fouché’s reasonable, measured approach to the marketplace. “We are fortunate to have marketing intelligence to know, understand and gauge what’s going on in the marketplace to make decisions as to what we want to play — or should play in — in the future,” said Zortman, a long-time colleague of Fouché going back to the early days at Chubb. And there you have it, marketing and intelligence, which is all you need to describe Lori Fouché, the new captain at Fireman’s Fund.